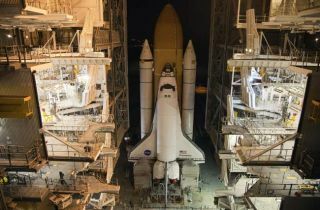 The space shuttle Discovery was rolled back to the Vehicle Assembly Building at NASA's Kennedy Space Center in Florida to allow crews to take x-ray scans beneath the foam insulation of all 108 support beams on Discovery's external tank. If you need a place to launch a rocket or put together a spaceship, you may be in luck: NASA is looking to rent out many of the facilities at its Kennedy Space Center in Florida. The space agency released a formal Notice of Availability and Request for Information yesterday (Jan. 24), seeking to gauge private industry interest in renting out the space processing and support facilities at Kennedy. These facilities may become available for commercial use when NASA's space shuttle program draws to a close later this year, agency officials said. In all, NASA's announcement lists 20 facilities that may be open to potential renters. They include the historic launch complexes 39A and 39B, which were built for the Apollo program and modified to accommodate space shuttle missions. And the cavernous Vehicle Assembly Building (VAB) — one of the largest buildings in the world by volume — may also be available, for companies that need to do launch-vehicle processing and preparation. "Kennedy has been working for some time to enable commercial space activities at the center that are in line with NASA's mission," Kennedy Center Director Bob Cabana said in a statement. "Partnering with the commercial space industry will help NASA meet its goals and help sustain facility assets to support our nation's space objectives." The announcement groups facilities into four classes: space vehicle processing and launch facilities; off-line processing facilities; payload processing facilities, and miscellaneous facilities. Notable entries on the list, in addition to the launch complexes and the VAB, are Kennedy's Orbiter Processing Facilities and its Shuttle Landing Facility. The list isn't set in stone, however. NASA is reserving the right to remove any buildings or facilities if the agency later determines it needs them for its own use. NASA also may pursue other options for disposition of the facilities if it wishes to do so, officials said. NASA has received previous commercial interest in some of the facilities at the center, officials said. The new announcement is an effort to spread the word as widely and fairly as possible.